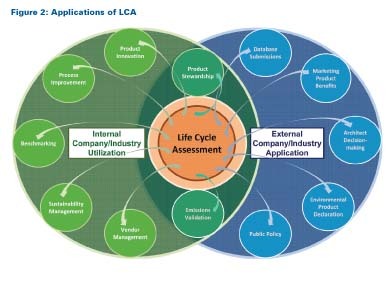 of Life Cycle Assessment (LCA), it provides a perfect lead-in to this article. and addressing the environmental impacts of products, processes, or services. releases to air, water, and land. familiar with the LCA concept. profile of mechanical insulation products. 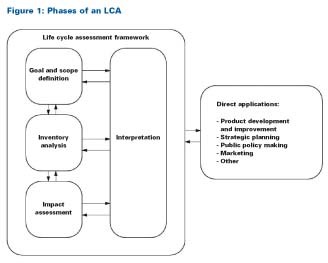 life cycle by the LCA practitioner, just to name a few. (ISO 14040) and described below. lies in its characteristics of transparency, rigor, and thoroughness. and sources of data, assumptions used, and limitations. the data, and this phase of the process involves its collection and analysis. and additional energy associated with completing each individual process stage. transportation requirements between each stage are to be included. involve dozens of specific processes and hundreds of flow inventories. addition, limitations are to be identified and explicitly explained. regarding data quality, results consistency, and sensitivity of assumptions. requires that the goal and scope definition be modified. competitive products performing the same function. expert and unbiased perspective to the means at which the study was conducted. methodologies used, and all background information of the study by the panel. final report and made publicly available. there is industry expertise providing project oversight and direction. be assigned to manage the project. develop its own LCA profile, saving substantial time and money in the process. delivery mechanisms in the United States. repository of LCI data that is collected and analyzed through similar methods. environmental impacts of various material and building product system choices. systems, namely Leadership in Energy and Environmental Design (LEED). Information on specific green building policy is provided later in this article. one or more characteristics of a product in terms of its environmental impacts. relevant to this discussion is the market segment-specific standard, ISO 21930 8.
developing EPDs for building products. program operator must perform to achieve compliance. Another element is the establishment of a functional unit. durability of a product or assembly in the life cycle profile. cycle impacts during the early design and decision-making stage. existing commercial buildings in this country. of the category indicator (e.g., photochemical ozone creation potential of methanol). potential environmental impacts of the product system(s) under study. cycle are, as far as possible, compiled and quantified. environmental declarations for one or more product categories. system or other product systems. Cycle Assessment. 7th ed. New York: Kluwer Academic Publishers, 2004. 1International Organization for Standardization (ISO). 2006. ISO 14040:2006 Environmental management ? Life cycle assessment ? Principles and framework. Geneva, Switzerland. 2International Organization for Standardization (ISO). 2006. ISO 14044:2006 Environmental management ? Life cycle assessment ? Requirements and guidelines. Geneva, Switzerland. 4Athena Sustainable Materials Institute. EcoCalculator. 6International Organization for Standardization (ISO). 7International Organization for Standardization (ISO). environmental declarations ? Principles and procedures. Geneva, Switzerland. 8International Organization for Standardization (ISO). declaration of building products. Geneva, Switzerland. Envelope Thermal Insulation Product Category Rule Number UL 110116. www.ul.com/global/documents/offerings/businesses/environment/PCRs/ULE_PCR_EnvelopeThermalInsulation.pdf. Renewable Energy. Commercial Reference Buildings. http://www1.eere.energy.gov/buildings/commercial_initiative/reference_buildings.html.